Note to self: weight down again, need to do more hunting!!! All that fence banging, or, some of you might call it fence "bashing" has made my arthritic elbow a little stiff and "crunchy". We call it "crunchy" if mom can feel the friction (kinda like bone to bone) in the elbow joint while doing stretching and range of motion exercise with me. 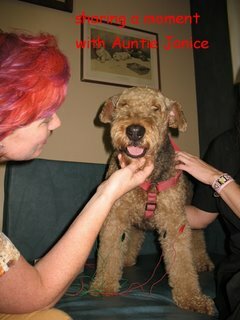 When this happens, I get to go see my Auntie Janice for acupuncture. I love my Auntie Janice so much that I'm always trying to come up with legitimate reasons (such as splitting my tooth and scaring mom half to death!!) so that I can go see her. When I found out that I was going to see Auntie Janice, I couldn't be happier! As usual, I marched into MY clinic, announced my presence to everyone, made my rounds around the clinic, nodded my head to Kayla (Auntie Janice's girl), and gave my favorite vet tech - Jennifer a nice growly head rub between the legs (my head, Jen's legs). After I was satisfied with the way things were running in MY clinic, I walked into my acupuncture room ready for my treatment. Auntie Janice introduced me to Tanya, the new vet assistant of MY clinic. Tanya seemed really nice, and I look forward to getting to know her. Auntie Janice asked mom if it would be ok for Tanya to stay for my acupuncture session, and after consulting with me, mom said it was ok. This was me, all happy and "awake" before the needles went in!! It was Tanya's first time meeting me, so she didn't know that I usually get really sleepy as soon as the first needle goes in. So Tanya kept a firm grip on my harness throughout thinking that I would be struggling. Much to her surprise, I was calmer than a .............turtle??? First few needles went in, can you see my eyes getting dopy?? Auntie Janice and mom always laugh at me when they see me start to get drowsy, because I try to fight it, but can never keep my eyes open long enough LOL! It really is amazing how well acupuncture works on me. It was definitely an eye opener for Tanya the new vet assistant in training!! MY clinic, MY vet, MY Janice!!! "Do we really have to go home??" Looks like you gurls had lotsa fun this summer! You look great with those ear muffs. I wish I can have em too, so I don't have to hear anyone telling me what to do! booboo...you are so "observant"!! You crack me up LOL, it sure looks like I was carrying an antenna on my head eh? Hey Sunshade, you look the same wet and dry. Lucky you. I look like a limp ball of matted hair when I'm wet. Bummer! 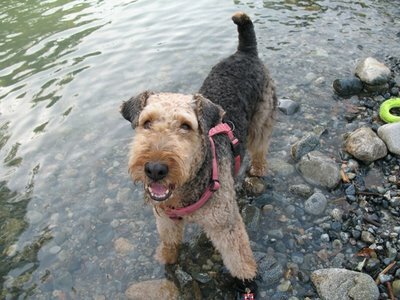 You are such a cutie :-) Do you find the acupuncture works ? Charlie has some arthritis and we have him on glucosamine tablets which seem to help - but maybe acupuncture would be beneficial for him too ? Although, I doubt he would go to sleep - we tried physio with him once - that was a disaster ! 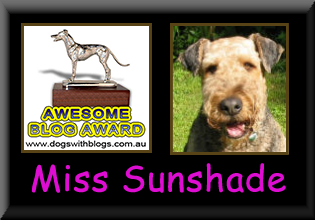 I love your blog - and I am going to nominate you for an "Awesome Blog Award" this month ! 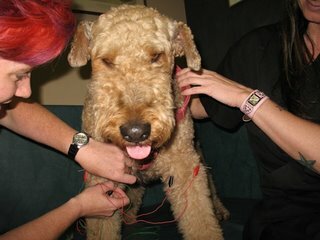 Ooooh can't let my you-mans see this - they will start using acupuncture on me as a chill pill!!!!!! I got a tennis ball with a hole in it too!!!!! I love my ballie. I'm not home much/enough these days but if you need a babysitter at all send us an email! oh I want to take my girl's to dogstar too - you will have to write more about how you like it! Wow, that accupuncture thing looks so relaxing. U R one lucky pooch. I love swimming too. Its been a long time since MaMa brought me to the beach. I miss it. Oh, BTW, my PaPa's sister (that makes her my auntie?) lives in Vancouver too. She is at some "Rabit Lane". Isn't that cute?! Hi.... in my blog is shaped my feelings, some poems, and pieces of my life, thanks to visit to me. 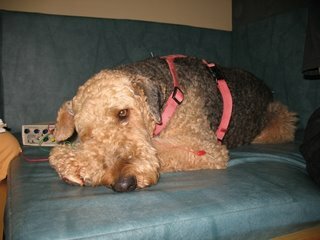 I know another dog that has had acupuncture, he does exactly the same thing as you Sunshade! He says it really helps with his arthritis too. 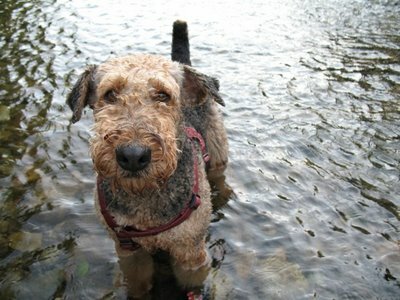 As special friends of Charlie and Opy - and DogsWithBlogs - you are invited to appear in the 2007 DogsWithBlogs calender. 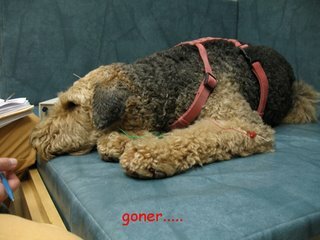 Please go here - http://dogswithblogs.com.au/calender.htm for further details. Hoping you will participate.